The support of local businesses and their employees is critical to the success of Big Give. 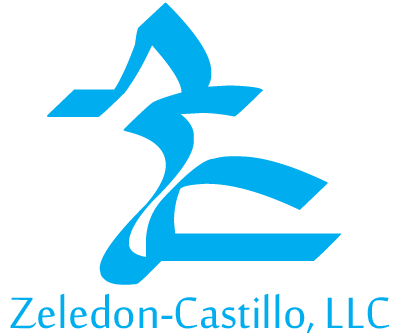 Not only does your participation help ensure a successful day of fundraising for over 500 area nonprofits, but your dedication to their important work will be recognized throughout South Central Texas. For the Big Give, we're offering your business an opportunity to engage your employees to donate to causes they're passionate about, and in turn, bring invaluable visibility to your business. Interested in learning more about Employee Giving and the value to your business? Download the info sheet below and contact The Nonprofit Council at info@tncouncil.org. Already involved in Employee Giving? Check out the Business Toolkit for marketing resources, communication templates, and tips on how to engage your employees, and how your employees can engage their networks. Ready to get started? Download and complete the Employee Engagement Commitment Form and submit it to the Nonprofit Council by March 1. Donating as a participating employee? Follow the directions here for more information. Below are some generous matches from three of our employee engagement participants this year. 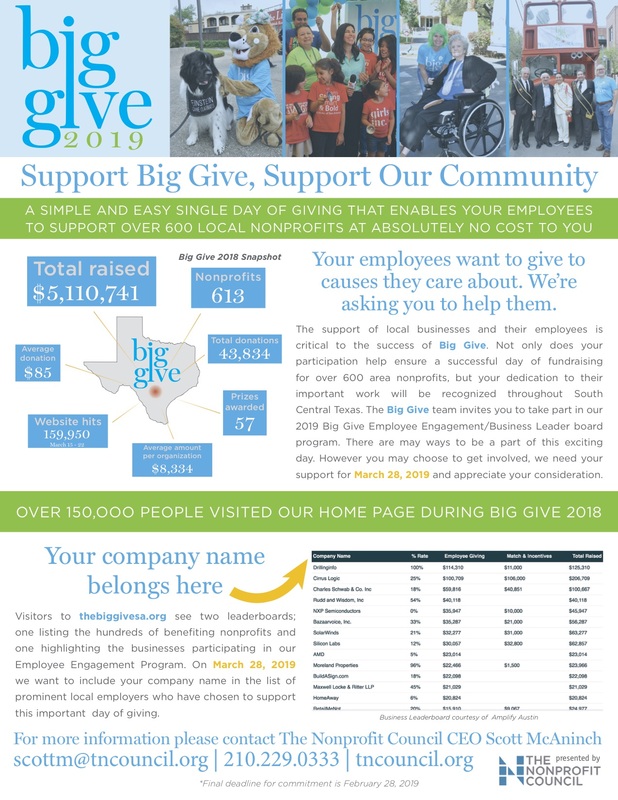 As an employee of one of these organizations, your gift will go even further for your chosen organization or cause during Big Give 2019! For each dollar an employee donates, Argo will match it by 1.5 times. For instance, if an Argo employee donates $25, Argo will provide a matching donation of $37.50! The minimum eligible donation for this match is $25. Documation will match every gift made by an employee 1:1. If employee participation reaches 75%, Documation will then increase their match commitment to 2:1! Schriver, Carmona & Company 1:1 Match: COMPLETE! Employees who give will have their gift matched by Schriver, Carmona & Company, up to $500! Donations made by Employees Bestica, Inc during the Big Give will be matched dollar for dollar, up to $5000! Curious about what Employee Engagement entails? 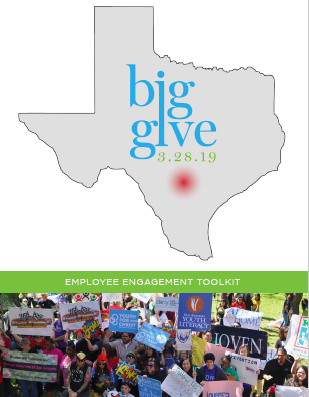 Check out this quick guide to Employee Engagement for Big Give to learn how we will support and recognize your business, and ways you can make Big Give even more successful and fun for the entire community! The Employee Engagement Toolkit will provide you with the basic resources you need, including how to run a successful Big Give campaign, how to promote your involvement through social media, and how to run a successful email campaign.